Diamondback ~ Model DB380 ~ .380 ACP. Rare Mint Unfired FI Garcia .380 Blue Steel Semi-Automatic Pistol with Box and Papers! 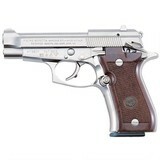 Kahr ~ Model P380 ~ .380 ACP. ULTRA RARE MODELO 1935 BERETTA VERSIONE LUSSO 1957…..INCISA E NICHELATA……..BRIGHT NICKEL FACTORY ENGRAVED….MINT NEW!!! Sterling Mark 2, Cal.380, Ser. B553XX.